Laying turf is a simple gardening technique, but there are a few rules you should observe to ensure that you get the best results from your new lawn. You can lay turf at any time of the year, but for the best results, you should really wait until the autumn months. This is because the soil will be easy to prepare and you won’t want to walk or play on the lawn while it is settling in. Plus, the rain will mean that you won’t have to water your lawn regularly while it takes root. Preparing the lawn is the most important part of laying your turf because, with the right soil, your lawn will be happy and healthy in its new location. Begin by clearing any weeds that have grown, either by using a weedkiller or by digging them up using a trowel. Don’t use any residual weed killer as this will stay in the soil and stop your turf establishing properly. Next, you should turn the soil so that it is well aerated. Use a garden fork and turn over at a depth of 20cm. You should also add in some compost, making sure that the matter is well rotted. Unevenly rotten compost will continue to decompose at different rates so may leave your lawn uneven after a few months. Ideally, you will leave your soil to settle over a few days after cultivating, or even a few weeks if you can. If you do this, you will need to do another round of weeding before you lay your turf. When you are ready to lay your turf, you might also like to add a top layer of fertiliser. This will give your turf plenty of nutrients for lots of healthy growth. Levelling the soil is quite simple but it does take some time and effort. Start by raking over the surface so that it is fairly even. Then tread using your boots so that the ground is firmed flat. Do this in several directions for the best results. Next, you should use a rake to level the soil again. Start by raking in one direction and then again in the other. You can continue these steps until you are happy that the ground is level. Leveling the soil before you lay the turf is important for a few reasons. First, puddles will gather in dips in the lawn creating a boggy surface that will eventually drown the grass in that area. Secondly, uneven grass will inevitably end up with bald patches that will make way for weeds and moss. While fixing unlevel lawns is possible, it is much easier to start with a level surface than have to spend time fixing it up later on. If the ground is already moist, there is no need to water again, but if not, just give the ground a little bit of water to encourage the grass roots down once the turf is laid. Once you are happy that you have a level surface, you can start laying the turf. You will need a board to stand on while you are laying the turf to prevent indenting the newly laid lawn and soil with your feet. You will also need a tamper which is a board attached to a broom handle at right angles. These are available at most garden centres. Start at the top far corner of your area. 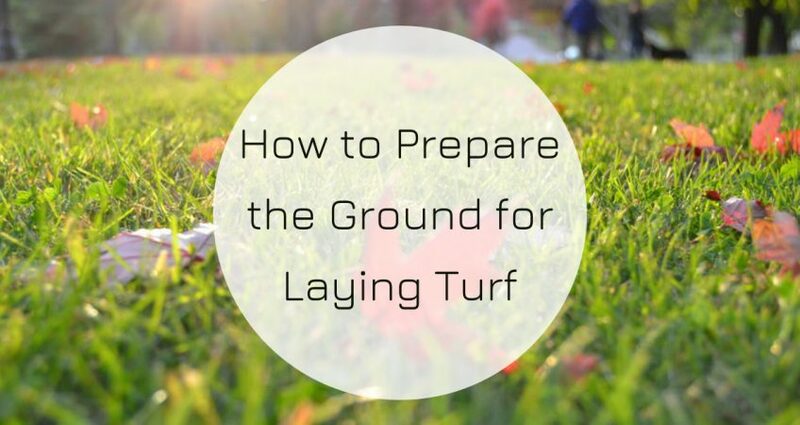 Ideally, once you have laid a piece of turf, you won’t be forced to stand on it to lay the next, so work backwards, always standing on the soil. Lay the first piece of turf in the corner and then work methodically, using a pattern similar to a bricklayer. This will stagger the edges of the turves and give you a better finish to your lawn once it is grown in. Make sure that each turf is laid flush to the previous one to create a tight fit. Have a bucket of soil to hand just in case you need to alter the level as you go. Once you have laid all the turves, use the tamper to level the grass. You should also add a top layer of mixed sand and soil to fill in any small gaps. Rake the mixture over the turf gently. Don’t be tempted to walk on it or play on it for at least a few weeks while the ground settles and the roots develop. If you have laid the turf in spring or summer, make sure that you provide enough water, especially in hot weather.